AS A MUM, I LOVE THE WAY YOUNG BOYS ARE: THEIR VORACITY FOR LIFE, CAPACITY TO DREAM, TIRELESS PHYSICALITY, AND THEIR PLAYFUL CODIFIED HUMOUR. EVERY MEMBER OF STEPHEN PAGE’S KIN POSSESSES THIS INALIENABLE BOY SPIRIT. Originally commissioned in 2005 for the Fifth Asia-Pacific Triennial of Contemporary Art in Brisbane, Page’s younger male kin (all nephews, except for son Hunter) take charge of The Studio with voice, live music, movement and seven endearing personalities. Page, in collaboration with his brother, composer David, has managed to mine the inner fragilities and strengths of the boys in relation to issues of discrimination, addiction, violence, and growing up as young Aboriginal men learning their traditions while firmly engaged in contemporary youth culture. The boys roll onto to the stage garrulously and kick off with a quick ‘bash’—they are convivial in their rendition of an AC/DC guitar riff (more Uncle David’s era), and aptly, with a drum solo of Rage against the Machine’s Killing in the Name. The boys are having a good time, the audience loosens. A car, stage left, is dramatically revealed in its smoking materiality: a burnt-out Torana. Peter England’s design abstracts the urban landscape simply, but strongly, re-contextualises the boys in a shifting montage of scenes. The car is theatrically pragmatic. Scrambling bodies crawl over and under, entering and exiting through paneless windows, popping up from the boot and the bonnet. Props are concealed and revealed on cue. The outer shell is used to sit and ponder issues such as the significance of the 1967 referendum, Aboriginal history told orally by older kin members, and their experiences of being labeled ‘coloured.’ The latter is charmingly mooted: are we not all “multi-coloured”, sometimes red from anger and sometimes green from sickness? The chameleon car in various lighting states (designer Glen Hughes), inscribes this—sometimes red, blue, green, white, ochre or black. Darker moments (such as the aural witnessing of a fight scene between adults) see the boys sit silently within the car. The stage turns cold, the boys interior. Kin is performed in a mix of styles, ranging from traditional Indigenous dance to hip hop popping and break, to contemporary Aboriginal phrasing. Torsos shift softly on the lateral plane, weight centred and balanced. The boys’ angular frames deepen the clarity of this grounded movement with paradoxical lightness. During a hip hop battle the beat of clapping sticks is substituted by our handclaps. David Page’s score artfully blends traditional and contemporary, live and recorded. 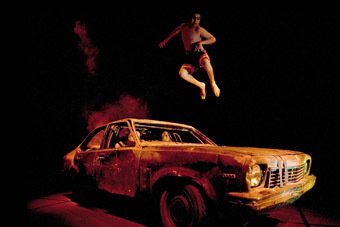 In Kin, ‘hanging out’, the framework for a series of compressed theatrical happenings, is made impressively real by the boys’ effortless performances, each embodying movement true to their physicality and character. Seven faces steal through the fourth wall, an invitation for us to bear intimate witness. More 2007 Sydney Festival: Anita Fontaine’s locative media work, Ghost Garden, in the Sydney Botanical Gardens for dLux/Media/Art, page 24, and virtuoso Finnish accordionist Kimmo Pohjonen in concert, page 47.